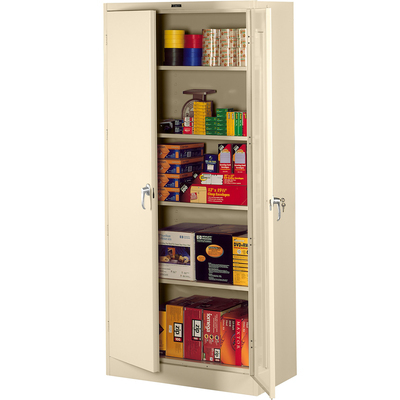 78" High Deluxe Storage Cabinet Features Heavy-Gauge Steel Throughout For Maximum Rigidity And Trouble-Free Performance For Heavy Loads. Includes Built-In Shelf Support And Many Different Slots For Shelves So You Can Adjust Them In 2" Increments. Reinforced Door Frames, Three-Point Locking System And Adjustable Shelves Ensure Maximum Security For Even The Bulkiest Materials. Four Knuckle-Hinges On Each Door Maintain Door Alignment. Two Brushed Chrome Handles, With One That Locks Both Doors, Make Door Opening And Closing Easy. Built-In Ventilation Louvers On The Back Panel Allow Air Circulation. Raised Base Keeps Contents From Contacting Moisture On Floor. Two Adjustable Levelers Compensate For Uneven Floors. Durable Powder-Coat Finish Easily Blends Into Any Office Environment..
78" High Deluxe Storage Cabinet Features Heavy-Gauge Steel Throughout For Maximum Rigidity And Trouble-Free Performance For Heavy Loads. Includes Built-In Shelf Support And Many Different Slots For Shelves So You Can Adjust Them In 2" Increments. Reinforced Door Frames, Three-Point Locking System And Adjustable Shelves Ensure Maximum Security For Even The Bulkiest Materials. Four Knuckle-Hinges On Each Door Maintain Door Alignment. Two Brushed Chrome Handles, With One That Locks Both Doors, Make Door Opening And Closing Easy. Built-In Ventilation Louvers On The Back Panel Allow Air Circulation. Raised Base Keeps Contents From Contacting Moisture On Floor. Two Adjustable Levelers Compensate For Uneven Floors. Durable Powder-Coat Finish Easily Blends Into Any Office Environment.